The Srebrenica genocide of the Bosnian War was commemorated at a special event at Rugby Art Gallery and Museum. The massacre of nearly 8,500 Muslims, mainly men and boys, by Bosnian Serb forces was the worst atrocity carried out in Europe since the Second World War. Bosnia was ripped apart by internal conflict following the disintegration of Yugoslavia. Just a day after the European Community recognised Bosnia-Herzogovina as a sovereign nation, war broke out when Bosnian Serbs started a process of so-called 'ethnic cleansing' with the aim of creating a Greater Serbia. The war culminated in the atrocity which took place in Srebrenica, which had been declared a 'safe zone' by the United Nations but was breached by Bosnian Serb forces on 11 July 1995. Srebrenica Memorial Day, promoted by the charity Remember Srebrenica, takes place on 11 July to remember the lives lost in the genocide and encourage communities to work towards ridding society of intolerance and hatred. The arts development team at Rugby Art Gallery and Museum worked with Tea Leaf Tales, the town's drama group for adults with learning disabilities, to mark the memorial day and its theme - acts of courage. Documented stories of courage from the Bosnian War include neighbours hiding friends in basements and braving interrogation by soldiers, teachers running through Sarajevo's infamous 'sniper alley' to visit children's homes to give lessons, and the community of the tiny village of Baljvine, who despite comprising both Bosnian Serbs and Muslim Bosniaks, refused to go to war and carried on living side-by-side in peace. Tea Leaf Tales interpreted such acts of courage through a series of mime performances in the Art Gallery and Museum's foyer on Wednesday (11 July). 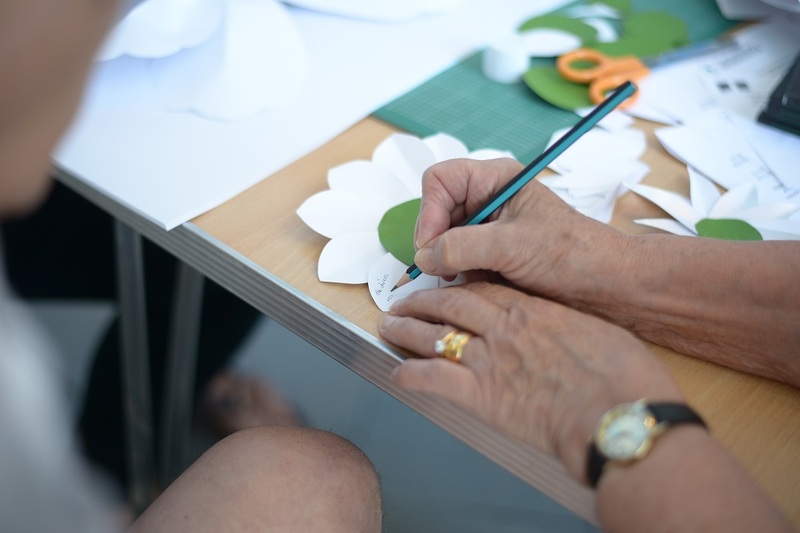 Visitors to the venue were also asked to commit personal messages of courage and solidarity with the spirit of Srebrenica Memorial Day to paper, with the messages being formed into the petals of a white flower - the symbol of remembrance of the genocide. "Rugby Art Gallery and Museum's arts development team supports a variety of innovative cultural projects in the borough through both funding and practical support. "The Srebrenica Memorial Day project with Tea Leaf Tales raises awareness of one of modern history's darkest chapters, a chapter we should ensure is never forgotten and is never repeated." Photo caption: Visitors wrote personal messages of courage and solidarity with the spirit of Srebrenica Memorial Day at the event.